We provide residential and commercial heating services. 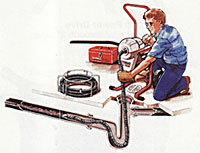 Our specialized and trained heating technicians will solve and repair the heating problem within the same day. We provide emergency heating repair services with a 45 minute response time, in most cases. Our heating estimate is FREE! Don�t forget to ask about our service maintenance agreements to keep your boiler running smoothly for years to come. Oil Hot Water Boiler - Whether you are encountering a no heat problem, or you are just looking to replace your current boiler, our professional heating technicians will be more then happy to aid your needs. Our technicians are fully qualified to work on oil boilers and can offer you fast 45-minute emergency for those cold months. If you are looking for an estimate to replace your boiler, give us a call to set up an appointment. Oil to Gas Conversions - If you are looking to convert your current oil fired heating system to a more efficient gas fired heating system, you have come to the right place! We are experts in that line of work and are highly qualified to do the job right. With oil prices through the roof and only rising, it�s time to consider converting to gas now. We make the process of converting to gas pain and hassle free, keeping you up to date on all the steps during the course. We cover everything from A to Z including decommission of the oil tank with city and state certifications as well as the permits and government officials. Call us today to set up an appointment for your FREE heating estimate. Gas Steam Boiler - Whether you are encountering a no heat problem, or you are just looking to replace your current boiler, our professional heating technicians will be more then happy to aid your needs. Our technicians are fully qualified to work on gas boilers and we provide immediate 45-minute emergency response time for those cold months. If you are looking for an estimate to replace your boiler, give us a call to set up an appointment. The estimate is FREE! Don�t forget to ask about our service maintenance agreements to keep your boiler running smoothly for years to come. Oil Steam Boiler - Whether you are encountering a no heat problem, or you are just looking to replace your current boiler, our professional heating technicians will be more then happy to aid your needs. Our technicians are fully qualified to work on oil boilers and can offer you fast 45-minute emergency for those cold months. If you are looking for an estimate to replace your boiler, give us a call to set up an appointment. The estimate is FREE! Don�t forget to ask about our service maintenance agreements to keep your furnace running smoothly for years to come. Gas Forced Hot Air Furnace - Whether you are encountering a no heat problem, or you are just looking to replace your current furnace, our professional heating technicians will be more then happy to aid your needs. Our technicians are fully qualified to work on gas forced hot air units and can offer you fast 45-minute emergency for those cold months. If you are looking for an estimate to replace your furnace, give us a call to set up an appointment. The estimate is FREE! Don�t forget to ask about our service maintenance agreements to keep your boiler running smoothly for years to come. Oil Forced Hot Air Furnace - Whether you are encountering a no heat problem, or you are just looking to replace your current furnace, our professional heating technicians will be more then happy to aid your needs. Our technicians are fully qualified to work on oil forced hot air units and can offer you fast 45-minute emergency for those cold months. If you are looking for an estimate to replace your furnace, give us a call and set up an appointment. The estimate is FREE! Don�t forget to ask about our service maintenance agreements to keep your boiler running smoothly for years to come. Heat Pump - Our trained professionals are qualified to work on all different makes and models of heat pumps. If you are experiencing a problem with your heat pump and need emergency service, our technicians will be on your location same day to take care of your problem. Baseboard - We provide baseboard repair and maintenance as well as new installation of baseboard heating. If you are having a problem with your current baseboard, our technicians will be more then welcome to provide you with a service call and troubleshoot the exact problem you are encountering. If you just added a new addition to your home or would like to replace your existing baseboard throughout your home, give us a call to set up an appointment for an estimate. Radiator - We provide radiator repair and maintenance as well as new installation of radiator heating. If you are having a problem with your current radiators, our technicians will be more then welcome to provide you with a service call and troubleshoot the exact problem you are encountering. If you just added a new addition to your home or would like to replace your existing baseboard throughout your home, give us a call to set up an appointment for an estimate. Our specialized and trained HVAC technicians are educated and experienced when it comes to central air conditioning systems. Our air conditioning technicians are EPA and NATE certified and carries extensive credentials. We offer fast 45-minute emergency air condition repair service for those hot summer months and get the job done right the first time. Whether your air conditioning unit needs something minor such a fuse to a Freon leak, our technicians will troubleshoot the situation and diagnose your problem accurately and efficiently. When your central air conditioning is not working up to par, or you think you might have a problem, give us a call today. AC Condenser Repair & Replacement - The A/C condenser performs pretty much the same function as an engine radiator, but the condenser cools the refrigerant (or Freon) in the auto A/C system. Typically, the A/C condenser should be flushed to remove any debris. In more current vehicle applications using high efficiency condensers, you should understand that they may not be able to be flushed. Why? The passages are simply too small and much of the debris gets lodged into the tube openings. Depending on the actual design of the A/C condenser, it may have to be replaced. Call us for an AC condenser unit replacement quote! Central Air Conditioning Installation - In this new and technology savvy world, most homes are being built with central air conditioning installed into them directly. We have helped many homes upgrade to energy efficient central air conditioning systems. These central air conditioners will lower energy consumption and lower your monthly utility bills. Contact us today and we will be more than happy to sit down with you to discuss possible money and energy saving factors. One simple phone call to make your summer a quiet and comfortable one. Rooftop Air Conditioning Units - Most businesses are equipped with specifically designed rooftop a/c units. When you are experiencing a problem or notice a change in the performance of your rooftop a/c unit, give us a call at any of the following numbers to have one of our highly trained technicians troubleshoot your problem. We will take all the necessary measures in order to provide you with the highest level of quality work and customer satisfaction. We also offer replacement of rooftop units. Air Conditioning Duct Service - Sometimes you notice less airflow in a certain room when you turn on your central air conditioning. There might be a problem with your ductwork. Sometimes, seams separate causing the ductwork to not operate efficiently. Our technicians will locate the exact problem and take the necessary measures to repair the situation. We also offer complete new installation of ductwork along with new installations of central air conditioning. Give us a call and ask about our different options when installing ductwork, there might be some facts you didn�t know! We have helped many homes upgrade to energy efficient central air conditioners. We install, repair and provide annual maintenance on all models and manufacturers central air units. Ductless Air Conditioning Service - For those who do not want to go through the installation process of central air conditioning, there is always a split system also known as a ductless system. These units come equipped with an evaporator that gets hung inside of the room you are looking to cool or heat and a condenser, which gets hung outside of the home. These two units work together to provide heating and/or cooling in certain rooms without the costly procedure of installing a new central air conditioning system. We also provide service and repair to existing slip or ductless systems. If you currently have a unit that does not seem to be working, give us a call and one of our technicians will be more than happy to troubleshoot your problem. To receive an estimate and private consultation for new installation of a split or ductless system, contact us today to set up an appointment.